Use of our tools, even an apron! Wake up your creative side. 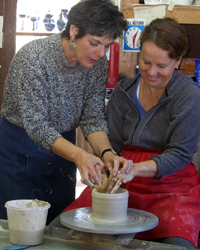 Ours is a no-fear factor pottery class. If structure is what you need to unleash your creative side, we are there to guide you and help you find your inner artist. 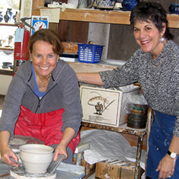 When you leave our studio you will have a real knowledge of how to work in clay. If you’ve already worked in clay and would like to fine tune what you already know, this is the studio for you. We work with all skill levels in a friendly class structure where you can learn at your own pace. Call us today, 805.772.2890, to reserve a place in our next session. Each class session runs one night a week for six weeks. Please call or email for current class schedule or private lession.